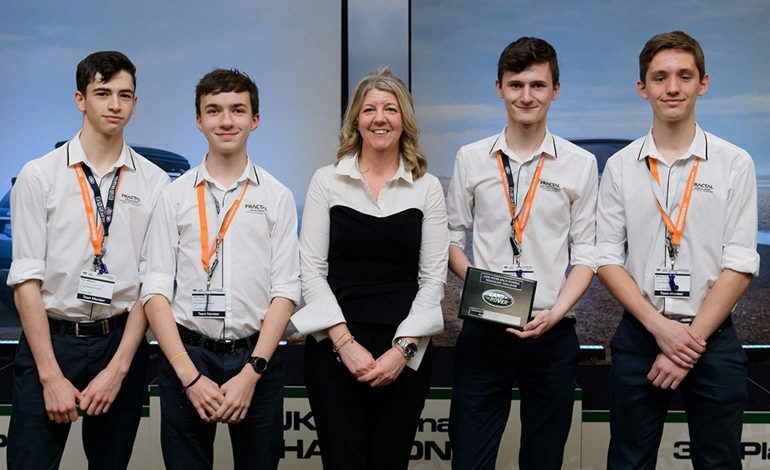 A team of aspiring engineers from King Edward’s School, known by their team name as ‘Fractal 4×4’, have been announced as joint UK champions of the Land Rover 4×4 in Schools Technology Challenge. The announcement secures the team’s place in the World Finals next year. The Year 12 KES Fractal 4×4 team were declared joint winners of the UK National Final alongside a team from The Thomas Hardye School in Dorchester. It’s the first time ever that two teams have been crowned joint winners. Hundreds of pupils across the UK participated in the competition, using software coding and new manufacturing technologies to design and build miniature remote-controlled four-wheel-drive all-terrain vehicles capable of negotiating obstacles and road surfaces including water dips, a rope bridge, and rocks. The two-day UK Final, held at the British Motor Museum in Warwickshire, included a bespoke track which wound up, over and around two Land Rover Discovery SUVs and was designed to replicate the off-road challenges facing a full-size all-terrain vehicle. Teams were scored on track performance and also presented their work and knowledge of vehicle design and engineering to a panel of judges. After their win, Alex Christopherson, mechanical engineer and team leader said: “The experiences of the UK Final have taught me a lot about the real world of engineering. “From having to do marketing and PR on multiple occasions – being interviewed on camera, and by specialists from JLR – to testing and showing off our car on track and undertaking a series of judging sessions. Xavier Raynes, the team’s software developer commented: “The seven weeks between the Regional Finals and the Nationals were, quite possibly, the most hectic weeks any of us have experienced: hundreds of hours of work, many late nights, followed by two long days at the British Motor Museum, competing against 25 other teams for the top spot. “The first day went remarkably well – our presentation went well, our pit display impressed, and our car performed brilliantly. Finn Williams, design engineer & team identity manager, added: “In the weeks before the challenge, all four of us were working independently on our parts, and in the days before and even on the morning of day one, when we saw everything come together there was a real sense of pride in our work, and a certain enjoyment in showing it off. Morgan Jones, the team’s electrical engineer said: “At the National Finals, Alex Heslop, Director of Electrical Engineering at Jaguar Land Rover spoke about how innovative electronics was the way forwards in the automotive industry, with the advent of electric, automated and connected vehicles. The Fractal 4×4 team were sponsored by a number of local businesses including Sitec, Novia, and Rotork, as well as Servicenow, Renishaw and Firebrand. Further support was provided by Refil, Freshworks, Interconics, the University of Bath and Minuteman Bath. As well as securing the UK National title, the team picked up a further two awards during the Final, including Best Engineered Car (Professional Class) and the Star Quality Portfolio Award. Chris Thorp, Responsible Business Director, Jaguar Land Rover, said: “We are passionate about inspiring the next generation of engineering talent and the Land Rover 4×4 in Schools Technology Challenge is a vital part of our education programme.